Effective immediately, “Penny the Vole” and all related and unrelated members of her family who have taken up residence in the perennial border at May Dreams Gardens are ordered to vacate the premise. Failure to move by midnight on September 10, 2009 to the meadow where the street dead ends will result in a forced removal and other dire consequences. All burrows and tunnels will no longer be safe at that time. I had hoped that the hole in the ground in the perennial border led to a secret underground garden fairy hideaway. I was in denial. I knew it was voles. We had met before when they tried to destroy my garden several years ago. They were a worthy adversary, as I recall. This evening I finally embraced the reality of the situation when I caught sight of the actual resident and confirmed it was a common meadow vole, Microtus pennsylvanicus. Voles seem so small and harmless, but they are as harmless as a rabbit in the garden, which means that they can not stay, at least not in my garden. They feed on grasses, sedges, roots, and some insects and in the winter they can chew on the bark of trees. Of course, they probably avoid nutsedge and thistle. If they ate just those, they could stay. I would even pay them. But then there is all that tunneling just below the surface. It disrupts the plants, like this balloon flower, Platycodon grandiflorus. I like to think that with balance, even pests like these meadow voles can stay in a garden in limited numbers so they cause minimal damage. But I don’t see the balance in this situation, so I’ll add the balance myself. 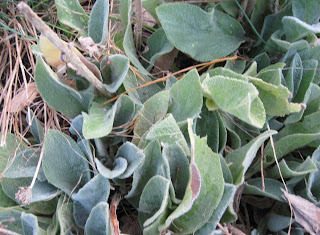 One of the voles is hiding in this clump of Lamb’s Ear, Stachys byzantina. It is best to not ask too many questions about my plans for the “eviction process”, for how I will bring balance back to nature in my garden. I’m not even sure myself what my plan is. I’m still working on the overall strategy. But I will have a plan. I will balance out the garden. I will replant the balloon flower. I will prevail in this new battle to save my garden. Yes, I have one of those rascals in my garden too. I saw it quite a lot this spring. I am wondering if the neighborhood cats took care of my problem or the garden fairies had a barbq because I haven't seen it any lately. Good luck on your quest to get rid of the vole. Lisa, trust me, if you saw one, you had more than one. Cats, snakes, and owls are all good predators. My voles learned not to eat poison, just sayin'. Penny had better run for her life. What is she thinking with a meadow right down the street? Perhaps it is time for you to get a kitten. Hey, my scramble letters are 'messo men'. They are messy! Yesterday it was psycho. I am sensing a pattern. When I saw the title of your post I thought 'Oh my God, she's named them!!' I have lost so much plant material to these rotten creatures. I will say peanut butter on the underside of thr trip lever on a mouse trap works pretty well. Time for me to do it again. We also have shrews that eat both insects and vegetation... where are the hawks when you want them?? My number one pest and garden destroyer! little cages of metal gutter guard is my best solution. If you see one you can trap hundreds and barely make a dent. 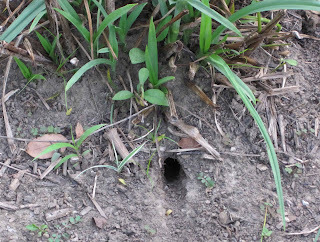 Just when you thought it was safe to go out in the garden...I think the voles kicked the rabbits out in an unseen turf war. You got rid of the rabbits, you'll get rid of the voles, but who will be next to invade your sanctuary? MMD raises an interesting point! If it's snakes, you'd better have some stout sticks available for visitors to your garden! Especially this one (I'm thinking ahead to GWA 2010). My scramble letters are hedgenab. That's appropriate for what you're trying to do! I wish you lots of luck. I think the reason we don't have then is our cat. She has been known to catch them and bring them up on the patio for an inspection by us. UGH! 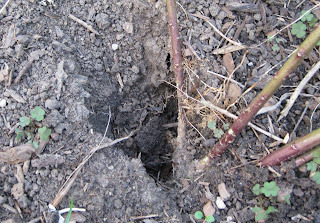 Voles are really so cute, but not when they eat your favorite plants. Onward, gardener, to fend off the vole. So sorry you have to defend your garden, Carol - but this is a real garden, not an idealized one so good luck! People on Dave's Garden mention using crushed oyster shells around bulbs because the voles don't like digging through it... maybe a drive to the ocean should go on the schedule? I hope that Penny reads your eviction notice and takes heed. If you do have a problem with her following directions, I could loan you my puppy, Sophie, who is very good at frightening these creatures away. Of course, she does have a bad habit of picking tomatoes off the vine and playing with them, so you might have to block off your vegetable garden. Maybe nature will take over and remove your voles. We have been plagued by hispid cotton rats for years. I have trapped so many I have lost count. Now this year there are none. I read somewhere that they are susceptible to some plague like disease which is natures way of controlling the population. I dae=re say they will be back.